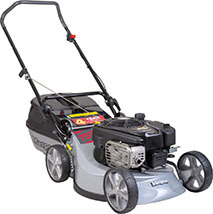 The 750 AL 2'n1 IC features a Briggs & Stratton 190cc OHV Series 850 Commercial IC ReadyStart™ engine which has a 4 year warranty. This mower also offers the mulching feature and Handle Lift System for easy catcher removal and storage. This model has a 4 year conditional extended warranty and a 2 year commercial engine warranty .